First it was shearwaters—now it’s jaegers! 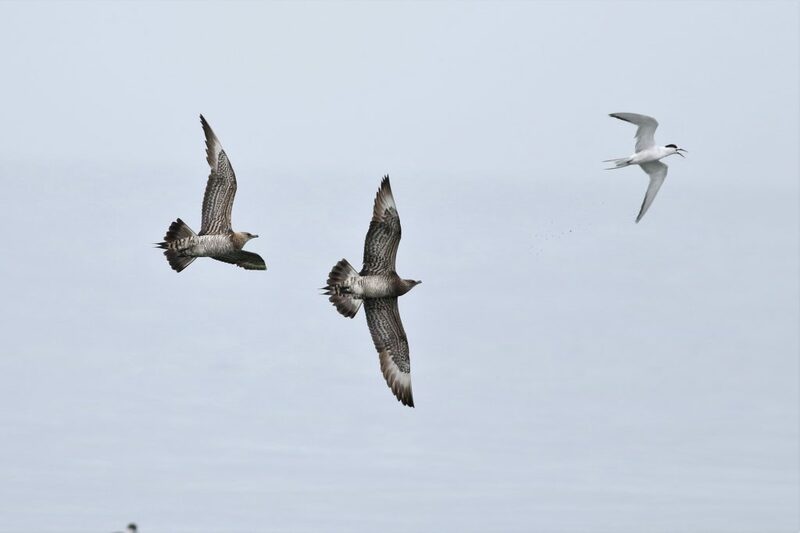 Earlier this fall the waters off Provincetown made news when an unprecedented concentration of thousands of Great Shearwaters was attracted inshore by a superabundance of small menhaden fish (a.k.a. peanut bunker) that were driven ashore by foraging mackerel. This influx afforded birders, fishermen, and the general public a unique opportunity to see these normally open ocean seabirds at practically arm’s length. Now, several weeks later, exceptional numbers of jaegers have taken center stage in these same waters. Dusky-colored and predatory, jaegers are gull-like seabirds that in North America nest on high latitude arctic tundra from Alaska to Labrador. 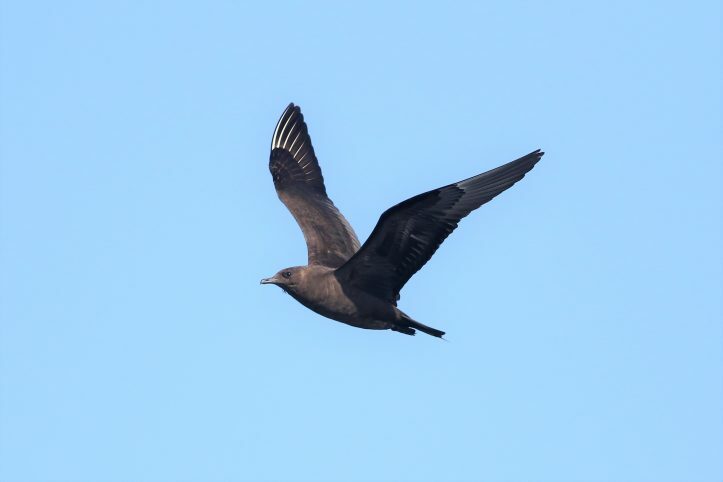 Taking several years to mature and exhibiting high variability and a complexity of plumages, jaeger identification can confound even the most experienced observers. Meaning “hunter” in German, the word “jaeger” (pronounced “yay-ger”) is well-suited to three closely related species—Pomarine, Parasitic, and Long-tailed—all distinctive in adult plumage because of two, long, pointed or twisted central tail feathers. But far more exciting is the kleptoparasitic lifestyle of jaegers. 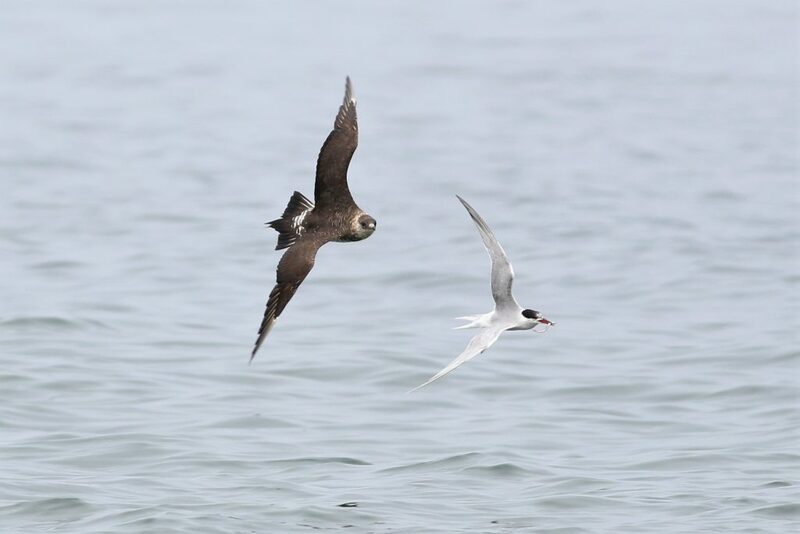 Kleptoparasites are species that obtain much of their food by stealing it from other species, which in the case of jaegers usually means smaller seabird species such as terns. In Provincetown it is Parasitic Jaegers that have been maintaining dominion over the hapless terns lingering off Race Point in recent weeks. Literally dozens of jaegers are currently tracking the hard-working terns off Race Point, the ever vigilant pirates constantly on the lookout for terns carrying fish in their beaks. Upon spying a fish-laden victim, a plundering jaeger will at once give aggressive chase. With fighter plane-like precision, one or more jaegers will pursue a target with aerial gymnastics hardly seen in any other bird species. So skillful at piracy are jaegers that they are often able to catch a falling fish relinquished by an intimidated tern before the fish hits the water! In the days ahead as the last of the lingering terns head for South America for the winter, the aerial pirates that have been recently harassing them off Provincetown will begin to drift away, shadowing the terns all the way to their South Atlantic wintering quarters. Although Parasitic Jaegers are capable of capturing fish or scavenging food on their own, during their non-breeding season at sea they generally prefer their criminal life style as a way to obtain food. Come spring however, the jaegers will head north for their arctic nesting grounds where their diet will shift to small rodents or shorebird eggs and chicks. Always predatory and always on the move, jaegers are fascinating seabirds that can only be admired when viewed in full pursuit of a fleeing tern, or when observed deftly flying amid the frothy troughs of a storm-tossed sea. Get to P-town soon to see these spectacular birds for yourself! This entry was posted in Birds and Birding and tagged birding, birds, Provincetown on October 19, 2017 by Wayne Petersen.